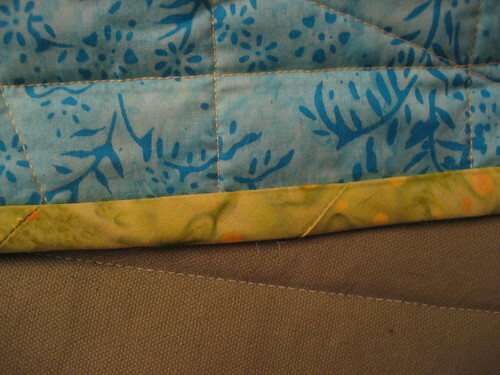 The seam to the right is where I started and finished attaching the binding by machine. I’m very proud of how neat that looks! 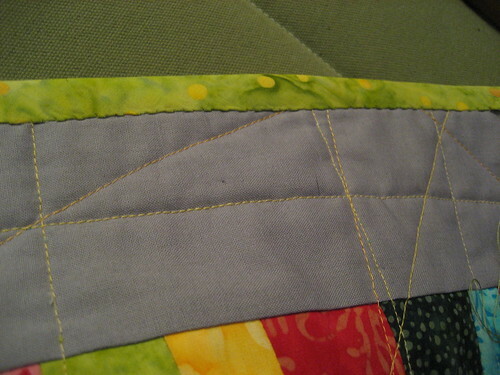 I used Jaybird Quilts’ tutorial on perfect binding. I made the binding myself using the method where you get one continuous tape by just sewing one seam. You can find loads of tutorials on YouTube if you search for “make bias tape continuously“. I’m attaching the binding by hand on the back. I’m using ladder stitch. It trakes time, but I like the way it turns out. A bit wavy, but not too much. I have another 3 sides and corners left to do. I’ve used scraps from the quilt top to make part of the back. I’ve added some fabric from my stash as well, like the grey seen here. I decided to quilt it all with random straight lines. I’m using a yellow thread and I quite like it. It shifts between a brighter and a more subbtle yellow but not very noticeably. Quilting like this was fun! I didn’t have to put too much thought into it and I think it works well with the wonky 9-patches on the front. 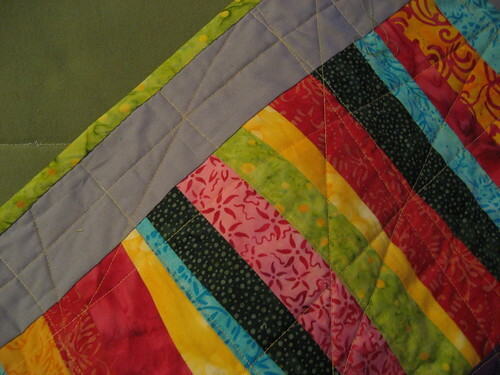 This entry was posted in Creative, Sewing and tagged colour, creative, fabric, quilt, sewing. Bookmark the permalink.